My inspiration for the Embracing Opposites challenge was an abstract yin yang. Not literally, of course; just conceptually. It came out pretty cool looking, but I wish it wasn't so cloudy today, as the pictures are washed out and blurrier than I'd like. :( We're heading out of town, though, so I'm out of time. I used the in-the-pot-swirl approach I'd come up with for our Nebula Swirl that allows for very fine, but well-defined color differentiation. The trick is to pour into the pot at a light trace, layering the colors as you go. Then, you let it thicken a bit before pouring side to side down the length of the mold. After I pulled out the divider, I used a hanger to swirl it in a spiral. I was very tempted to cut it out in a circle with a biscuit cutter -- to better convey the yin yang theme -- but I wasn't sure that was allowed, and now they are probably too hard. BTW, I cpop'd this batch, not to gel the colors, but because I am way too impatient to let it sit overnight before I cut it. The sodium lactate helps to harden it, but I've been known to cut my bars when they are still hot from the oven! I used the same modified version of Amy's slow moving recipe I'd used for the spin swirl, as I usually master batch, and still had some leftover. Unlike Amy who has a cool master batch setup, I mix my batches in a big bucket and then pour it into number of old coconut oil containers (labelled with the recipe or I'll forget!) that are small enough for my stick blender to get into. They also fit better in my pantry that way. 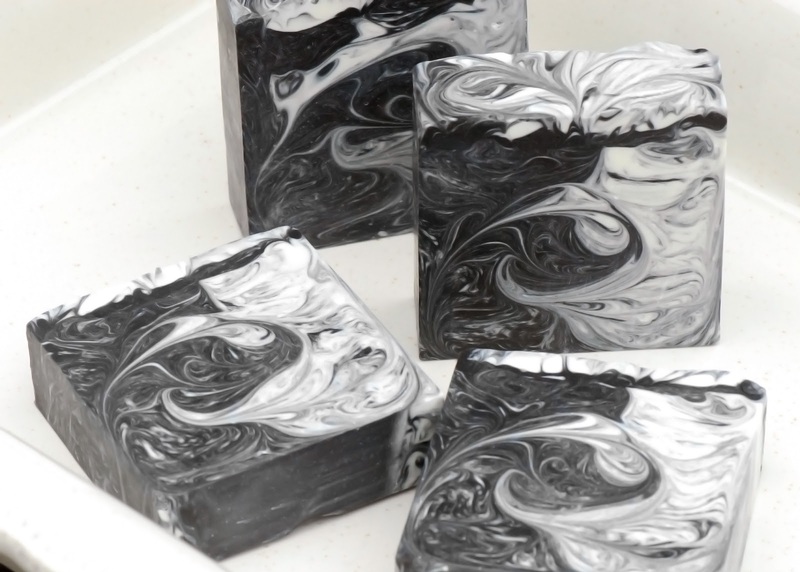 Obviously this is just black and white, but I used black oxide (TKB Trading, link) instead of activated charcoal to make the black to be really dark (which is more apparent in person). For the white, I used titanium oxide that's specifically for mixing with oil (Wholesale Supplies, link), not water. I always pre-mix my colors with some of the base oils to minimize specks. If it's for one small batch, I just measure the color into a ziploc baggie, add some oil, and smoosh it up until it's homogeneous. To use it, I just snip the corner and squeeze it into my batter. FWIW, I tend to use more color when making soap for challenges than I would otherwise, just to get it to show up in the photos. I can't wait to see what others have come up with -- I'm always awed by everyone's creativity and skill! These are fabulous, Claudia! I love the thin lines you achieved. Wish I could see these in person, as I'm sure the pictures do not do them justice. I love the bird profile in the bottom left corner of the top picture. I feel like it is looking right at me. Just gorgeous! 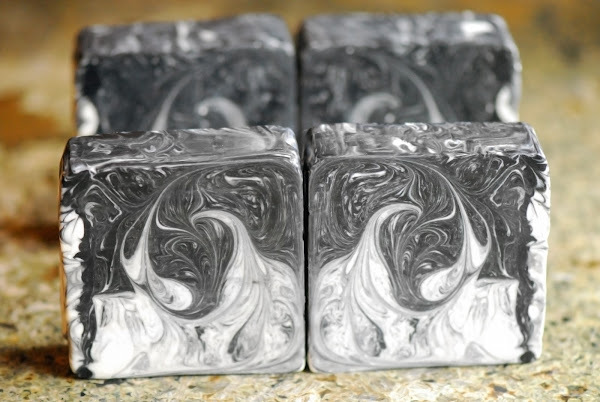 Your soap is beautiful. Love your creativity. Also thanks for the tip on mixing colors. Creative spin on the yin/yang. Turned out very nice and still shows up well in your photos. I love the black and white theme and the delicate fine lines you got Claudia! 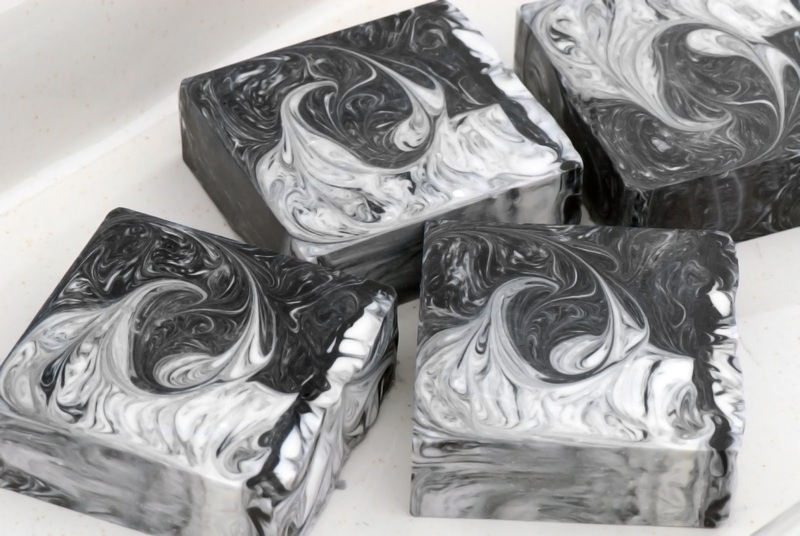 Your challenge soaps are so inspiring. Such detail and thought. Could you share how you figured out the sap value of the costco soap you used at 35%. I haven't found it on a calculator and imagine you did the long math! Thank you Claudia and company! For the Costco oil, I don't consider it one SAP value, I use the percentages on the label on the back. It's 50% olive, 40% canola and 10% grape seed. So, if I want to use 10 oz of this oil, I put it in soapcalc as three entries: 5 oz olive, 4 oz canola and 1 oz grape seed. I keep meeting to write a better soapcalc, but haven't gotten around to it, yet! Claudia thank you so much! How I could be so thick this morning is amazing. I've been thinking about this all morning on and off! Yes this makes perfect sense of course! Thank you thank you! LOL Do you like the feel of your soap? I love the look! :) You're not thick. It's easy to assume everything is too technical, when really it's all just recipes. I'm mixed on this one, as I like the feel of it, but it takes awhile to cure. I just switched back to my old favorite (36% coconut, 30% lard, 20% soybean, 10% rice bran, 4% castor), and realized it's too hard, though. It cures quickly and makes lovely bubbles, but it's brittle. It's 66% hard oils, where the slow-moving one is 54%, so I think I will try lowering the coconut to 30%, and increasing the rice bran to 16%. FWIW, if I was using the Costco blend with the harder one, I'd use it to replace just the soybean. Hum I don't consider lard a hard oil! LOL FWIW my new favorite is 56% OO 31%CO 4% Castor and 9 % Cocoa Butter or Mango Butter. It makes the most lovely soap I have it on my blog in a pink sugar. Cuts perfectly and stamps easily too and of course it smells yum! These are absolutely breathtaking! Oh My Goodness....you've got the perfect touch! Claudia I'm still intrigued by this soap! Was the design a happy accident or did you use a specific swirl like an S between the light and dark side? Maybe a large C or rounded Z. It is so mesmerizing.